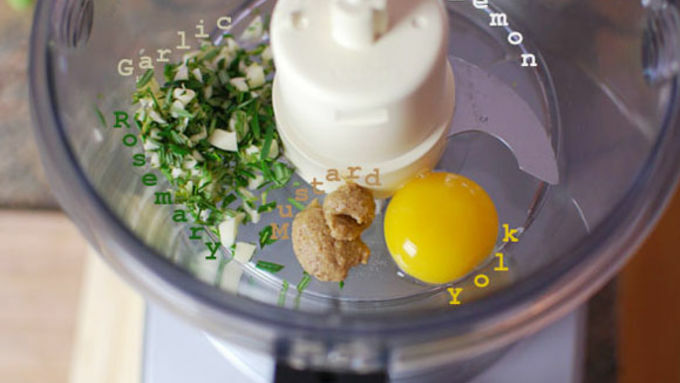 Make the aioli - In a blender or food processor, add all the ingredients except for the oils. Turn on and process for about 30 seconds. With the machIne still running, very slowly drizzle in about 1/4 of the oil and stop. Watch mixture and as you see it thicken slightly, very slowly add more of the oil until it is all added. 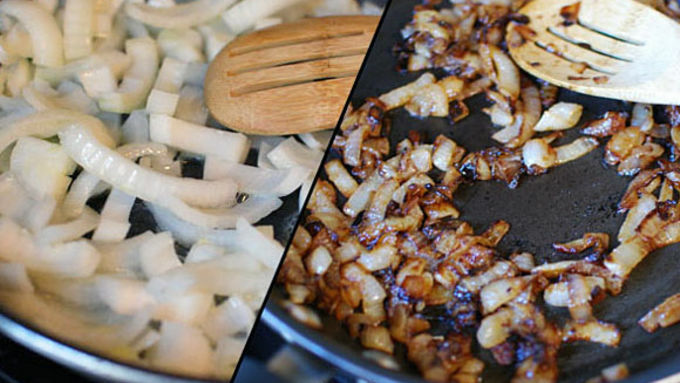 Caramelize the onions - Slice the onions into 1/4 circle slices. Saute in butter on medium for about 45 minutes, stirring often until they become very brown. 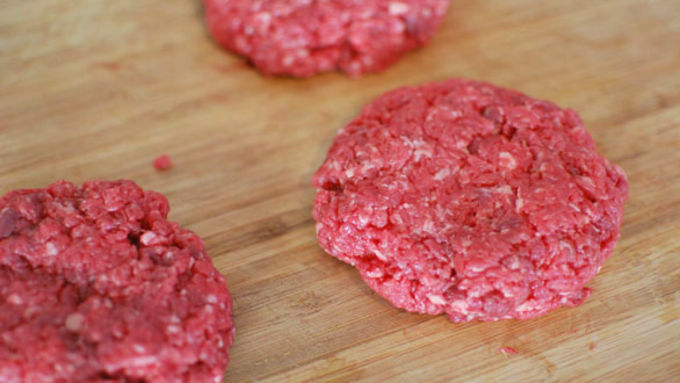 Make the patties - Place your meat in the freezer for about 30 - 45 minutes before you begin. Slice some of the larger chunks of fat off of the meat and slice into cubes. Place in your food processor (with a little salt) in 2 or 3 batches depending on how large your processor is. Pulse about 15 times to make a nice coarse ground beef. Form the beef into 3 patties. Cook the burgers - In a frying pan with a mix of butter and olive oil, cook the burgers covered and on high heat for around 5 minutes a side. After flipping the first time, add the cheese right away so it melts while the second side cooks. Spread some of the rosemary aioli on both sides of the bun. 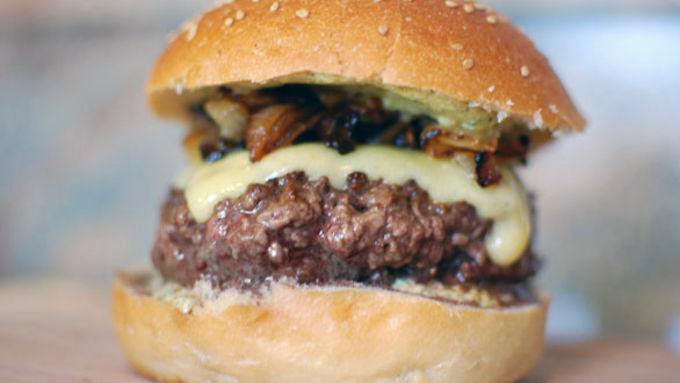 Place the burger on the bottom bun and top with the caramelized onions. Serve. A new burger chain opened here in Boston called 5 Napkin. They have a few locations in NYC, Miami, and Atlanta, and they have one of the best burgers I have eaten in recent memory. 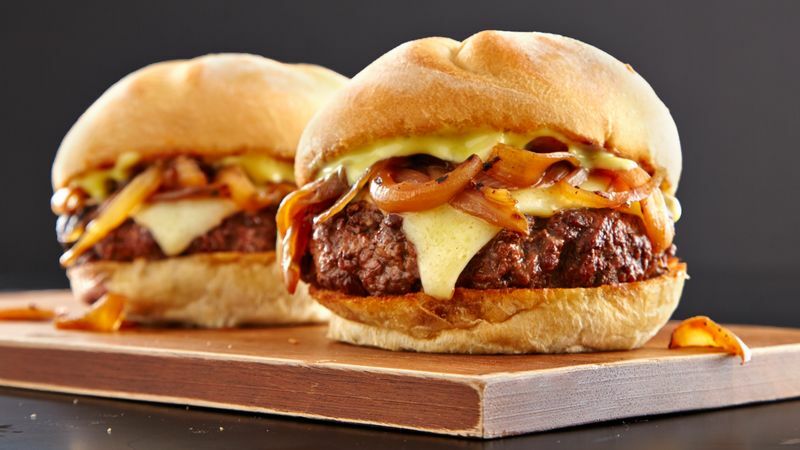 It’s called the 5 Napkin Signature Burger, and it boasts caramelized onions, Gruyere cheese, and a rosemary aioli. This burger is near perfect. The meats are ground fresh, the doneness was exactly to my liking, and the rosemary and onions really complimented the beef without overpowering it. When Tablespoon asked me about Iconic Burgers, and what great burgers I had eaten recently, The 5 Napkin burger instantly came to mind. I couldn't wait to get in the kitchen and try my hand at making a burger so beefy, savory, and delicious! This recipe for a 5 Napkin Signature Burger sure helps if you don’t live close to one of their urban locations! Ground beef is just fine for most burgers I eat, but when I am really trying for something special I grind my own in the food processor. But, store-bought ground beef works great too! 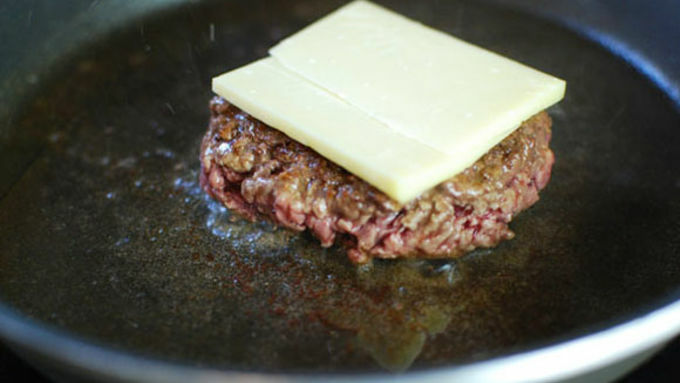 Cooking your burger in a cast iron would be best, but any frying pan will work. Really though. This was the best burger I have ever eaten. Yeah, maybe it took me an hour of work plus shopping time and lots of cash to produce 3 cheeseburgers, but I don’t care. It was worth every second and every penny. If you go through all this effort, you really want to make the burger rare. I bought quality meat from a trusted source and ground it myself, so I know it’s safe to eat. They have some great tater tots at 5 Napkin too, but I wasn't about to start a second endeavor. I just got these guys at the store.